I am three days into Inktober. The door up above was for Day One. They give you prompts for Inktober and the prompt for Day One, Oct. 1, was "poisonous." I love the idea of following the prompts but life got in the way. It rained and there went my plan to walk to Hertel Avenue and sketch the 5 Venoms Tattoo Studio which was my plan on how to deal with "poisonous." But the rain did not let up till later so I dashed across the street to the zoo and drew this door. I feel so blessed to live across the street from a Victorian-era zoo! That is how I described it on Instagram. The zoo brass keeps trying to obliterate all historic elements but a few have escaped and this door is one. Howard and I have long admired it. "Who would be authorized to open that door?" Howard marveled on one occasion. 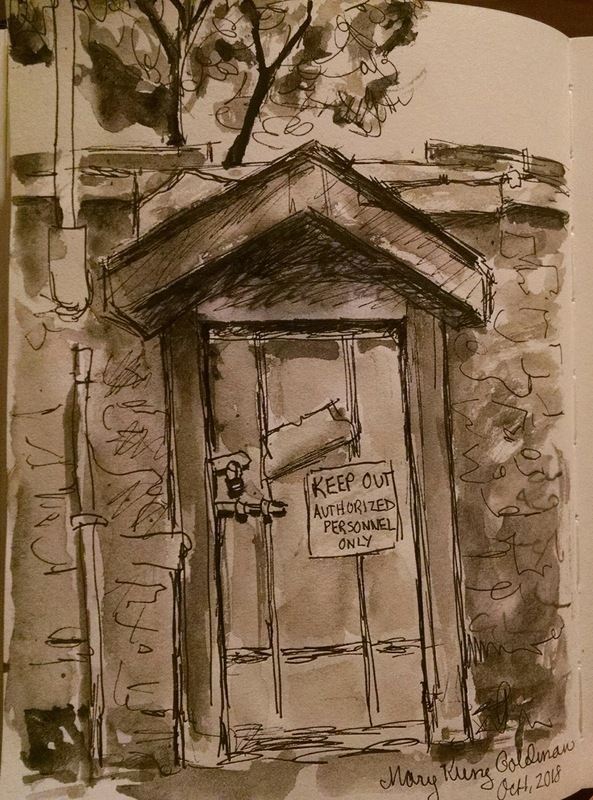 They suggest that you take a theme for Inktober and mine is Look In Your Own Backyard. I love finding seasonal Inktober-ish stuff looking out my back door. I realize, as I mentioned, that I am blessed. I have this zoo right on hand, and Delaware Park, and right next door one of the nation's great cemeteries, Forest Lawn, complete with the grave of a U.S. president. Today I sketched the statue of Mozart in the park. I will have to post it. Imagine how good I will be at the end of October.